To make the most of Louis' last day off we had a mother and son trip to Birmingham for some shopping and a spot of lunch. He is the perfect shopping companion, he carries the bags, finds a comfy spot and gets a book out, he's got all the time in the world. We did some normal high street shopping but thats dull compared to the old stuff. 3 Dresses, two scarves and an old lady shopping bag for £50 all from my favourite vintage shop. All screwed up out of the bag but this is fantastically cut and the embroidered chiffon sleeves are divine. 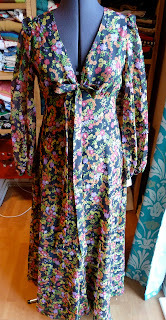 Another floor length beautifully cut that will eventually get shortened about an half an hour before I need to wear it! Miss Belle loves anything that's proper old lady style.